Seven marathons. In seven days. On seven continents? You would be forgiven for thinking Becca Pizzi is seven kinds of crazy. "I get that a lot," said Pizzi. She is vying to be the first U.S. woman to complete the World Marathon Challenge. She is a 35-year-old day-care center operator from Belmont, Massachusetts. She is one of 15 competitors from around the globe who will attempt the feat in January. Pizzi is no stranger to the rigors and ravages of the classic 26.2-mile distance. She is a veteran of 45 marathons. She has run 15 Boston Marathons. And she is 27 states into her quest to run a marathon in all 50 states. Friends say she has one setting: Beast Mode. But she has never tried anything like this. Nor has any other woman from the U.S.
"The second I heard about it, I knew I was born to run this race," Pizzi told The Associated Press. "I am doing it to represent my country. And to inspire the world that you can do anything you put your mind to." On Jan. 23, 2016, she'll be in Union Glacier, Antarctica. She will run the first of seven full marathons. Next up she will run in marathons in Punta Arenas, Chile and Miami. Then she will run in Madrid and Marrakech, Morocco. Then she will go to Dubai, United Arab Emirates and Sydney. Within a span of 168 hours she will have conquered all seven continents. They are Antarctica, South America, North America, Europe, Africa, Asia and Australia. 59 of those will be spent recovering in compression socks aboard a charter flight. It will be shuttling competitors 23,560 miles from race to race. "It is going to be an uncomfortable seven days," she said. "We may not even get a shower. It is basically going to be run, sleep, eat, repeat." Four other Americans, all men, will join her. Competitors from Australia, Germany, Japan, Morocco and Singapore will also take part. They include three other women. So far, only one woman has completed the Challenge. Marianna Zaikova of Finland. She did it in its first running in 2015. It is not just exhausting. At $36,000, it is expensive. Pizzi fronted the cash but has been lining up corporate sponsors to help defray the cost. So far, two companies are covering about half of her expenses. Those companies are Ultima and Dr. Cool. Ultima makes electrolyte replacement drinks. Dr. Cool sells compression sleeves and other performance items. Pizzi is a single mom. She has been training 30 hours a week. That includes 80-100 miles a week of running. Plus yoga and cross-training workouts. 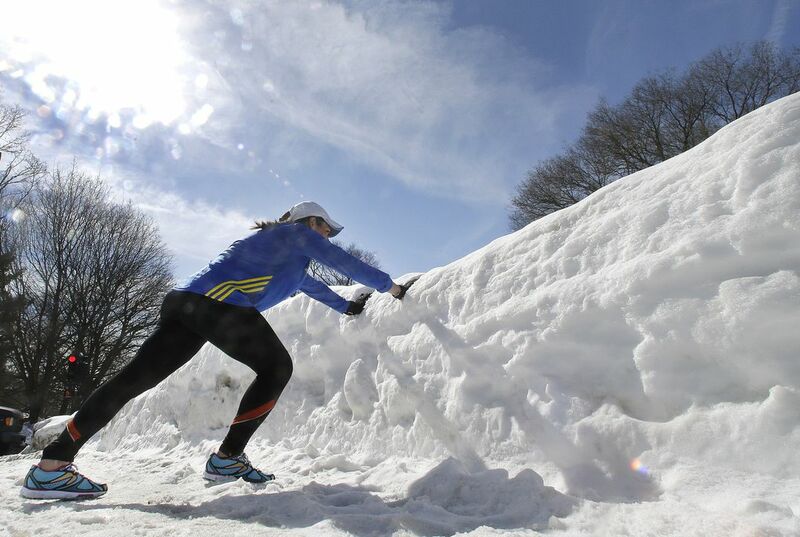 Boston lawyer Jenny Rikoski does long runs with Pizzi on weekends. She is flying to Chile. She might also fly to Antarctica. She will cheer for her friend. She finds the long runs both inspiring and empowering. "It shows how far we have come," said Rikoski, 37. "Forty years ago, women were not allowed to run the Boston Marathon. Now we have a Bostonian who is ready to run not just one marathon, but seven in a week. It shows how strong women are and what they can accomplish." Pizzi's training partner is Janet Chambers, 43, of Boston. She is confident Pizzi has the right stuff. "She can do anything. She finishes everything she starts." Pizzi's personal best time to run a marathon is 3 hours, 25 minutes. She plans to pace herself by running each of the seven races closer to four hours. She will have to cope with extreme cold and heat as well as wildly varying running surfaces. There will be snow in Antarctica. And there will be sand in the Sahara. What is stressing her out the most? It is thinking about being apart from her 7-year-old daughter. And just thinking in general. "It is all going to be about focus. Mind over matter," she said. "If I let my mind go, the race is over. I will really have to take this one marathon at a time." What: Running seven marathons in seven days. Where: Antarctica,Punta Arenas, Chile, Miami, Madrid, Marrakech, Morocco, Dubai and Sydney. Why: To represent her country and inspire others to work harder. How: By running seven marathons, in different countries, in seven days. I was surprised there even was a race around the world. why:"im doing this to represent my country"
"Run,sleep,eat, and repeat" means that she will do this everyday until she accomplishes her goal. “Run, sleep, eat, repeat” means that whoever said it, their day most likely is just those events. They probably wake up, eat, run, then go to sleep. Mine would be "Video games, food, and more video games". Run, sleep, eat, repeat means that Pizzi is going to basically only going to run her marathons,sleep for rest,eat,and do only those things for the whole week. Run, sleep, eat, repeat is a common saying used usually when practicing for something big. It's the process of doing the exact thing over and over again until your body is used to it. The phrase "Run, sleep, eat, repeat" means that you wake up, you run, you go to sleep, then you eat and run again. Becca Pizzi states that running, sleeping, and eating are the only things that she will have time for during this series of marathons. CTQ: "Run, sleep, eat, repeat..." means that she has almost no time to waste, so she needs to get her basic needs then will run for the rest of the day.